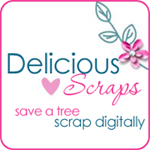 Delicious Scraps: New PTU Commercial Use Layered Tag Templates and FREE Sampler Commercial Use Tag! New PTU Commercial Use Layered Tag Templates and FREE Sampler Commercial Use Tag! Here is a free sampler - Commercial Use OK. Thank you so much for this Freebie. I want to let you know that I posted a link to your blog in CBH Digital Scrapbooking Freebies, under the Page 1 post on Jan. 15, 2010. Thanks again. Thank you so much for this terrific tag sample! Great for adding a date or place name, thank you!